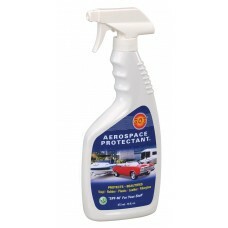 Vinyl treated with 303 Aerospace Protectant blocks UV Rays, maintains new appearance. Sunlight breaks-down unprotected surface. Plasticizers escape, vinyl cracks, fades and fails. When applied to the underside of your cover, it also helps prevent mildew. 303 Protectant is very economical, and you'll find many other uses for it around the home, RV, boat and car. Using the wrong vinyl treatment product is worse than using nothing at all! In fact, a well-known automotive vinyl treatment contains silicone oil, which is death to vinyl. Avoid products that contain any type of oil, have a greasy feeling, contain petroleum distillates, or leave a coating that dries like wax.